H. Hargrove was born Nicolo Sturiano on June 16, 1947 in Palermo, Italy. 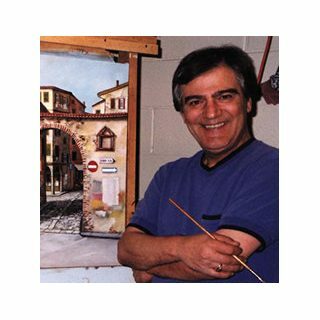 Nicolo was raised in Marsala, Italy, where his parents, three brothers and one sister lived. During his youth, he spent every summer on his Grandfather’s farm, which was not unlike those of rural America. Hargrove’s earliest recollection of drawing was at the age of six or seven when he received a set of colored pencils as a gift. He was fascinated by the colors and began to draw and experiment with them. Thus began many years of experimentation, for Hargrove never had any formal art training; his art, prints and posters today represent his relentless desire to constantly perfect his techniques and explore new ones. In the early seventies, Hargrove left the Greenwich Village gallery and began painting for a prominent art dealer in New York. In 1973, he was approached by the owners of the Chicago art wholesaler, Foxman’s Oil Paintings. Thus began his almost twenty year exclusive association with this respected establishment. They introduced Hargrove to a new, vast marketplace for his art, prints and posters, the Home Show Art business, which has been responsible for putting Hargrove in more than one and one-half million homes across America. H. Hargrove's accomplishments are many. Over one million of H. Hargrove's images are displayed in homes throughout the world. He today ranks as one of the country's most-collected and renowned living artists. He has painted over 100 limited editions, and most have completely sold out! H. Hargrove has been featured on television, radio and in magazines throughout the world. In 1999 alone, he appeared on the NBC Today Show, ABC Television, FOX Television and local network and public television. Other highlights in 1999 included a retrospective showing of his work at the historic Cincinnati Art Club where the artist and his celebrated guest, hall-of-fame basketball player Oscar Robertson raised thousands of dollars for inner city children. The Children's Miracle Network benefited from a charitable appearance by H. Hargrove in New Orleans. H. Hargrove and Norm Abrams from "This Old House" raised thousands of dollars for children's hospitals. The artist was recently asked to come to a special event at the state capital in New Jersey. 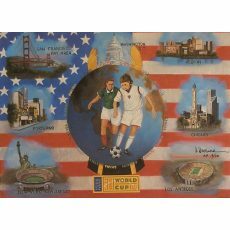 H. Hargrove presented Governor Christine Todd Whitman with a limited edition of the "World is Watching" to help celebrate the "kickoff" of the Women's World Cup Soccer Tournament. Additionally, H. Hargrove was honored by an invitation to our Nation's Capital by the United States Marines Corps in a special showing of his work at the Pentagon. Notwithstanding his immense talents with both brush and silk screen, Hargrove has become renowned as a master Story Teller. His affectionate and playful renderings of American life in art, prints and posters have truly captured the hearts of many.